When the Second Continental Congress assembled in Philadelphia in 1775, Washington was elected Commander in Chief of the Continental Army. He took command of his poorly trained troops and embarkedon a war that would last six years. In 1781, with the aid of the French allies, he forced the surrender of Cornwallis at Yorktown. When the new Constitution was ratified, he was elected President.His leadership on the battlefield won America its independence, but it was his leadership in office that created the mold from which the United States was cast. Meticulously designed, this dazzling tribute to the 1st President of the United States features a highly detailed engraving of the "Father of Our Country" on the obverse. 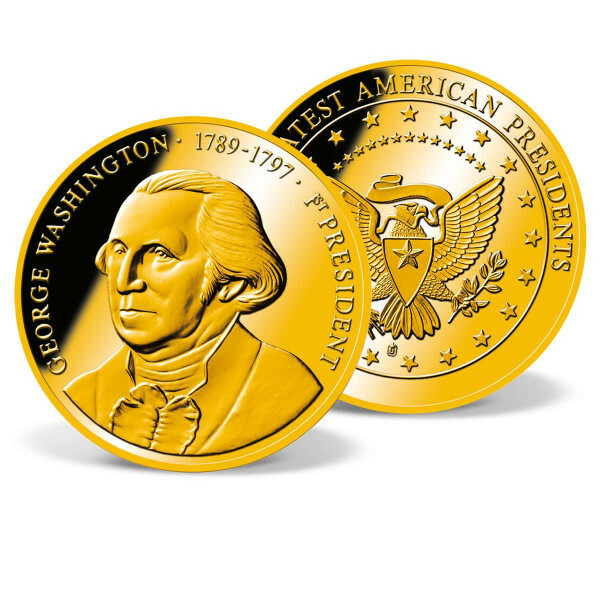 Luxuriously layered in 24k gold, the GeorgeWashington commemorative coin is limited to only 9,999 complete collections worldwide. This commemorative coin is minted to the highest quality "Proof" standard and comes in its own protective capsule to preserve itfor generations to come - a true collector's item.